My love for Edmodo as a teacher knows no bounds. I have been using the education-geared social network for several months now and I really do think that it is the wave of the future. Seriously, if you are not using it now, start. I have been having trouble getting my students to get their homework done, or to even think of doing homework. Math, it seemed, was for school; home was for TV. Then I decided to try an experiment. On our assignment notebook board I wrote: “Check Edmodo at 7pm.” Since finding out last week that all of my students, even the most rural of farm kids, has internet access, there was no excuse not to check it. Several of my students got iPod Touches for Christmas (they seem to be the Gameboy of this generation) and they loaded their devices up with the Edmodo app (which is fantastic, by the way). At 7 pm I posted a math question. It was the kind I used to give my students in the form of a copied mini-worksheet: a daily word problem that they, for the most part, ignore. The first night I got 8 of my 16 students replying to the question. The second night it was 11, and the third it was all of them. I got them to do work at home, after dinner, during prime time! They did not even know what the assignment was; just that it was coming. I don’t even need to give a reward anymore; they check Edmodo on their own, casually, the same way they would check their email or Facebook. And I have to be honest, I am seeing an uptick in their interest in math, or at least in the conversations that we are having about the subject. I am not saying that social media is the cure-all, but it does represent a form of interaction that my students are comfortable with. I am sure that I could have arguments about how this is not preparing them for the real world, or that I am pandering to my student’s anti-social, media-obsessed digital lifestyle. But I can’t argue that my students seem more interested in their subjects when they are allowed to use tools that they are familiar with and find interesting. And I have to admit, it is nice to look at my Edmodo page and see a student asking for help on a math problem after school, and then see that several of her classmates have pitched in to offer help. Tools like this are new to everyone, and I can’t wait to see how they pan out. Social networking has been all the rage the last few years. However, like so many things with the Internet, social media has started out as a tremendous waste of time and then over time seems to have become a mainstream waste of time and finally a tool of modern life as we know it. The problem with social networking is that we have professional lives and a private lives. Facebook is a fantastic tool for sharing jokes with my college buddies, but would I want my boss to see them? Facebook has recently introduced a way to create ‘lists’ of people that you want to share things with, but they were always hard to manage, and Facebook as a company has never been very enthusiastic about keeping their user’s data private and separate from their professional lives. The answer to this was to maintain two accounts, a Facebook account for your friends and, for the adventurous, family; and another account/service for your professional networking, in my case, LinkedIn. Maintaining two different accounts is time consuming, and what happens when the two overlap? After some initial missteps, Google has waded into the social networking scene with Google+. 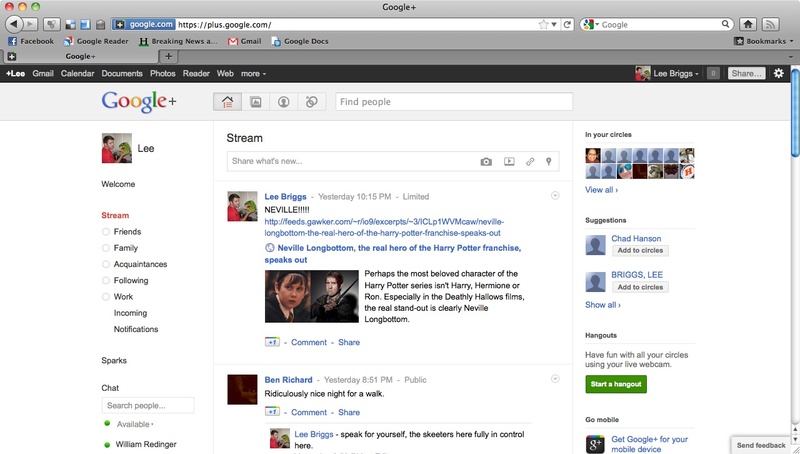 Google+ looks a lot like Facebook. Except that all the Google services that we use everyday such as Google Documents, Picasa (now Google photos) and Blogger (now Google Blogs) are all incorporated into Google+. The primary difference with Facebook, however, is the idea of “social circles.” In Google+ you do not “friend” someone, instead Google acknowledges the existence of family, friends, co-workers, acquaintances, and any other group you wish to create. 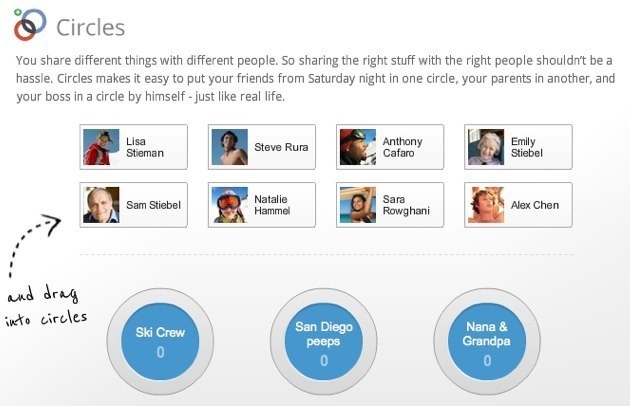 All of your content is shared only with these easy-to-manage groups. For example, my latest embarrassing, geeky rant on the last episode of Doctor Who will never be shared with my colleges at work, just as the latest draft of our district’s technology policy will never been seen by my college roommate. And all of this will be hidden from the parents in my school, who will only see my latest spelling lists and missing work lists. All of these “Circles” are easy to manage, and Google has gone out of its way to make sure that privacy (something that has dogged Facebook from the get-go) has been made a priority. Will there be mistakes made? Sure, Google makes it clear that Google+ is in ‘testing’ until the kinks get hammered out. What is exciting is that this new tool has the ability to connect all of the stray ‘cloud’ computing services out there to the people that need them.